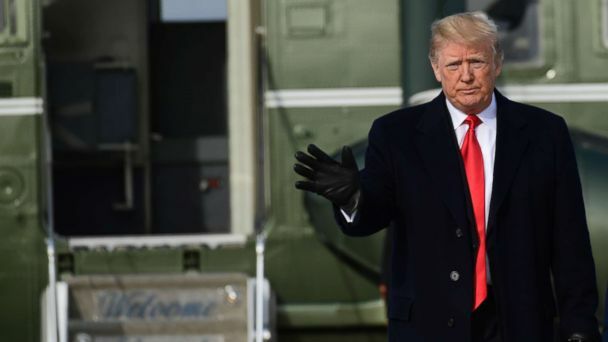 President Donald Trump made the honorary coin toss at the 119th Army-Navy game, one of the oldest rivalries in college football. Navy won the toss. The president was joined by Secretary of Defense James Mattis on the field for the national anthem and toss. Trump shook hands with the captains for the Black Knights and Midshipmen afterward and then joined the Navy side to kick off the game. Between quarters the president, who had once attended New York Military Academy in the Hudson Valley, switched off between sitting on the Army side and the Navy side to show he's not biased one way or the other. It was the president's first visit to the game as commander-in-chief, though he had visited as president-elect in 2016 and made an appearance on CBS Sports. "I just love the armed forces," Trump said in 2016. "I mean, I don't know if it's necessarily the best football, but it's very good. But, boy, do they have a spirit. More than anybody. It's beautiful." Since the storied match-up between the Black Knights and Midshipmen began in 1890, 10 sitting presidents have attended. President Barack Obama visited for the game in 2011. Before the coin toss, the stadium joined in a moment of silence for the late President George H.W. Bush, a former Navy aviator. Joining Trump and Mattis at the game were Chairman of the Joint Chiefs of Staff Gen. Joseph Dunford and his replacement, Gen. Mark Milley, Secretary of State Mike Pompeo, Secretary of the Interior Ryan Zinke, Sen. James Risch, R-Idaho, and Sen. James Lankford, R-Oklahoma. Army has won the last three games against Navy. The winner takes home the "Commander in Chief" trophy.